With a 4.3-inch widescreen display, you’ll always get the big picture. 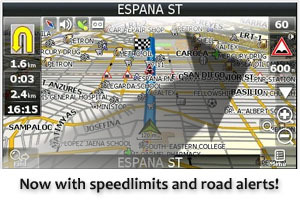 View more map details, driving directions, photos and videos in bright, brilliant color. carNAVi has a unique sleek, slim design with a flat touch panel to fit comfortably in your pocket. carNAVi leads your way with voice guided turn-by-turn directions to get you there on time and keep you safe on the road. Preloaded with a detailed roadmap covering the whole Philippines including many thousands of points of interest (POI), preinstalled detailed maps of Malaysia and Singapore and a worldwide map of major roads and highways, it’s compact, versatile and easy to use. Additional free detailed maps* of Cambodia, Indonesia, Vietnam, Taiwan, Hong Kong, Thailand and many other countries are available. Simply touch the state of the art flat-touch-panel colour screen, key in your destination and your carNAVi takes you there with turn-by-turn spoken directions in English or Tagalog, 2-D or 3-D map view with elevated flyover, tunnels and smooth map updates. Outside your car its rechargeable lithium-polymer battery makes it convenient for mobile navigation on foot with up to 5 hours’ usage between charges. ** Latest map guarantee with free lifetime map updates for the Philippines. The USB mass storage device is compatible with Windows® 2000 or later and Mac® OS X 10.4 or later.